Jared Unzipped: Yule Grog 2015 Part 4: Samuel Adams Merry Maker Gingerbread Stout. Yule Grog 2015 Part 4: Samuel Adams Merry Maker Gingerbread Stout. My fourth and final beer of the 2015 Yule Grog is the Samuel Adams Merry Maker Gingerbread Stout. I've looked forward to drinking this beer for quite a while. Typically, I'm quite happy with other Samuel Adams brews, especially their Cherry Wheat Ale. In fact, the first beer I ever purchased when I turned 21 years old was a Samuel Adams Boston Lager. Needless to say, my expectations are high when it comes to the Merry Maker. Let's hope this stout succeeds. As with all of my Yule Grog reviews, I will actively be taking notes as I drink the beer for the first time. My notes will be divided into two sections -- cold out of the fridge and at room temperature. No matter what I experience, I will notate and share it in my review. I have not been coerced or influenced by the brewer in any way. My review will be honest and straightforward. 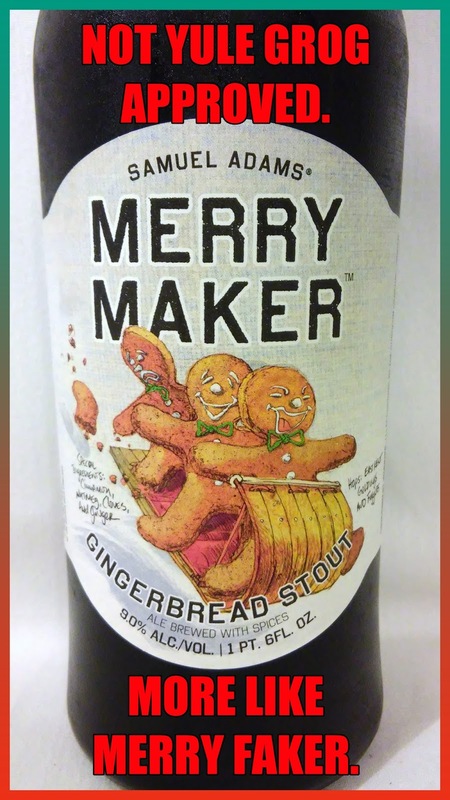 Merry Maker Gingerbread Stout is ready for purchase annually in November. It is 9.0% Alc. by volume and available nationwide in limited release 22 ounce bottles. 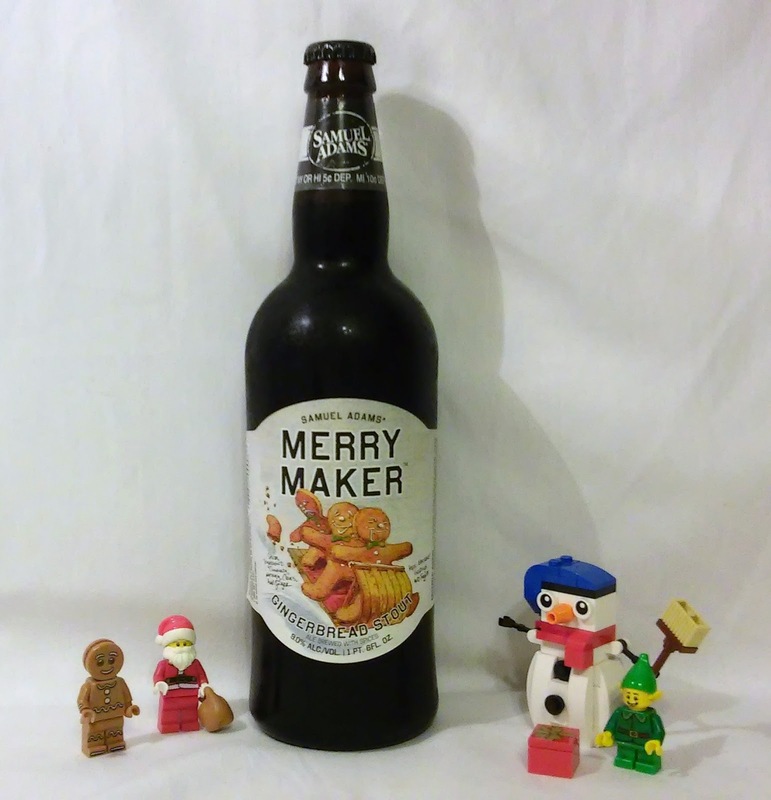 The Merry Maker is brewed with cinnamon, nutmeg, cloves and ginger. And now... it's time to drink! It's very dark and quite syrupy in consistency. Has a foamy, creamy head. The initial swallow is rich in roasted malt flavor. The bitterness is light, but especially noticeable on the sides of my tongue. Roasted flavor is quite strong and overpowering. I am unable to taste the spices at all. Tastes pretty much like any run-of-the-mill stout beer, like a Guinness. It doesn't taste bad, but it's definitely nothing special. I might as well be drinking the average stout beer. I thought I could taste the cloves for a sheer moment... maybe? The smell of the spices has risen only ever slightly. Unfortunately, I still can't actually taste any of the spices whatsoever. The flavor profile has not changed at all. Well... at least I didn't pour this beer out. Honestly, the Merry Maker was unimpressive and boring. The label might claim to have seasonal spices involved in the brewing process, but I couldn't taste them at all. I spent eight dollars on this 22 ounce beer, with nothing to show for it. For much less, I could have bought a standard Guinness and had the exact same experience. Never again would I buy the Merry Maker because the price doesn't warrant the lacking flavor. I expect better from Samuel Adams. Unfortunately, the Merry Maker fails to deliver on the promise of robust, spicy holiday flavor. Ordinary, drab and lackluster, the Merry Maker does not receive my approval. Well, this wraps up the 2015 Yule Grog. Sadly, only one of the four beers I reviewed was approved. Perhaps I'll have better luck next year!